Describing terrorism as “one of the most serious threats” to global peace, India today made a strong pitch for early adoption of a convention mooted by it over a decade ago to tackle the menace, days after its two key cities were rocked by serial blasts which left more than 50 persons dead. India today termed as “unfortunate” Pakistan’s violation of ceasefire along the LoC in Jammu and Kashmir and appealed to Islamabad not to vitiate the atmosphere and disturb the peace process between the two countries. Pakistan is not a member of the Nuclear Suppliers’ Group (NSG) and as such, the group has no say in Pakistan’s nuclear programme or its assets, foreign office spokesperson Muhammad Sadiq has said. The nine-day laborious WTO talks to salvage the Doha Trade Round collapsed today after the US was locked in a deadlock with India and China over import rules for farm products. Pro-Taliban militants attacked a security post and took up to 30 hostages today in Pakistan’s Swat valley, a day after insurgents killed three army intelligence staffers, officials said. President George W. Bush yesterday approved the execution of an army private, the first time in over a half-century that a President has affirmed a death sentence for a member of the US military. A teenage Sikh girl today won a legal battle to wear ‘kara’, a religious bangle, in her school, which banned her from attending classes for breaking the “no jewellery” rule nine months ago. Sarika Watkins Singh (14) was excluded from Aberdare Girls’ School in South Wales in November 2007, for refusing to remove a wrist bangle. Notorious international criminal Charles Sobhraj’s 19-year-old girlfriend has claimed to have received death threats from a local jailed criminal, whom she also accused of demanding Rs 1 crore from her lover. Harvard-educated Indian origin judge Navanethem Pillay is the new UN High Commissioner for Human Rights after the General Assembly voted unanimously to confirm her nomination to the sensitive post. A contempt of court petition was filed yesterday on behalf of Dr Abdul Qadeer Khan in the Islamabad High Court against 11 people, including President Pervez Musharraf, for flouting court orders of lifting a ban on Dr Khan's movement and allowing him to meet his relatives and friends. The US commander of space shuttle Discovery believes life probably exists somewhere in outer space, but there is a simple reason why aliens have not visited earth -- the journey is too tough. A moderate earthquake struck east of Los Angeles on Tuesday, shaking tall buildings in the city but there were no immediate reports of injuries, major damage or power outages. The earthquake, which struck at 11:42 am local time (1842 GMT), was measured at magnitude 5.8. It was centred about 30 miles (48 km) east of Los Angeles near the community of Chino Hills, where it was felt strongly. 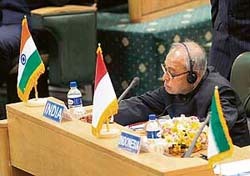 "I would particularly underline the need for concerted efforts by all of us to work towards early finalisation and adoption of a comprehensive convention on international terrorism, a draft for which was presented by India at the United Nations as far back as 1996,” external affairs minister Pranab Mukherjee said at the 15th Ministerial Meeting of the Non-Aligned Movement (NAM) here. He said if "we did not send a strong message that our movement stands resolutely for international cooperation in bringing the perpetrators, organisers financiers and sponsors of all acts of terrorism to justice." “An act of terrorism anywhere is a threat to peace and stability everywhere,” he said. Mukherjee termed terrorism as "one of the most serious" threats to global peace and said it “negates the fundamental principles of justice” and can have no justification. “It would be my appeal to the Pakistani authorities to ensure that the ceasefire is maintained and both sides maintain peace and tranquillity at the border,” external affairs minister Pranab Mukherjee told reporters here. Mukherjee, who is here for the Non-Aligned Movement (NAM) ministerial meet, said all issues between India and Pakistan were being discussed within the umbrella of the composite dialogue process and that process should be allowed to continue.“Nothing should be done to vitiate the atmosphere so that the dialogue process becomes disturbed,” he said. Asked whether the ceasefire violation had put the Indo-Pak relations in choppy weather, Mukherjee said, “I would not like to say that.” “The fact of the matter is unfortunately in the last few weeks incidents of violation of ceasefire have taken place and ceasefire is very important,” he said. Responding to questions on reports that Pakistan has agreed to shelve any opposition to India-US nuclear deal in the agency under US pressure, the spokesperson said there was no truth in these reports. He said Pakistan’s stance on the matter was clear. The country’s national security interests were supreme and the government would do whatever was necessary to protect them. Referring to the investigation into Abdul Qadeer Khan’s alleged role in nuclear proliferation, he said relevance of the issue to foreign policy had been resolved several years ago. Recent statements in the media were only important in a domestic context, he added. The spokesperson said the country needed energy and civilian nuclear power plants would help in that regard. Sadiq said the Indo-Pak relationship was very important for regional prosperity, adding that relations were moving in a positive direction. He confirmed that the ceasefire along the Line of Control had been violated thrice in the past few days. He also said India had not provided any evidence to confirm allegations that Pakistan had been involved in the bombing of its embassy in Kabul. The spokesperson said Prime Minister Yousuf Raza Gilani would lead the Pakistani delegation at the SAARC summit in Colombo on August 2-3. Indian and Pakistani foreign ministers would meet on its sidelines, he said, adding that no meeting had yet been confirmed between the two prime ministers. WTO chief Pascal Lamy said the core group of seven nations, including India, the US, EU, China and Brazil, failed to reach a convergence over special safeguard mechanism sought by developing countries against agriculture imports. The seven-year-old trade talks, launched in 2001, got bogged down this time around as India and China demanded lower trigger point for imposing higher duties in case of import surge, sources said. * The main issues seemed to be the level of US trade-distorting farm subsidies and the scope of exceptions for developing countries on industrial tariff cuts. * The talks focused on farm and industry subsidy and tariff cuts, leaving most other areas until later. * The US made an early offer to cut its farm subsidies to $15 billion, and accepted a further cut to $14.5 billion in a compromise proposal last week. * The new figure is less than one third of the current ceiling, but twice current outlays, so developing countries said it was not enough. * Rich countries such as the US and EU members remained at odds with emerging nations such as China and India over proposals to shield developing countries' infant industries from the full force of industrial tariff cuts. The incidents delivered the most serious blow yet to a peace deal signed two months ago in the northwestern valley, where the militants have become more active in recent weeks because they say the government has not lived up to its side of the accord. Swat had been a top tourist destination until militants, led by a radical cleric Fazlullah, launched a campaign of violence last year to enforce Taliban-style Islamic law in the valley. Today, they attacked a joint military-police post in the Kabal area, 35 km (22 miles) north-west of Mingora, Swat’s main town, and captured 30 police and paramilitary personnel, according to officials, though a militant spokesperson put the number at 27. Two soldiers and a young girl were killed when security forces traded fire with militants around Kabal after attack on the post. Security forces also arrested several suspects in a search of the village. Yesterday, insurgents ambushed and killed three intelligence officials as they were driving back to Mingora. With his signature from the Oval Office, Bush said yes to the military’s request to execute Ronald A. Gray, the White House confirmed. Gray had been convicted in connection with a spree of four murders and eight rapes in the Fayetteville, North Carolina, during an over eight-month period in the late 1980s while stationed at Fort Bragg. “While approving a sentence of death for a member of our armed services is a serious and difficult decision for a commander-in-chief, the President believes the facts of this case leave no doubt that the sentence is just and warranted,” White House press secretary Dana Perino said. Unlike in the civilian courts, a member of the US armed forces cannot be executed until the President approves the death sentence. Gray has been on death row at the US Disciplinary Barracks at Fort Leavenworth, Kansas, since April 1988. Nihita Biswas, who earlier hit headlines for disclosing her affair with 64-year-old Sobhraj, charged that Tashi Lama, serving life term on murder and robbery charges in the Central Jail where the ‘bikini killer’ is also lodged, threatened to kill both her and her boyfriend through phone calls made by his friends. "Lama’s friends have threatened me and my family as well as Sobhraj,” she told reporters yesterday, adding the criminal had also demanded Rs 1 crore from her boyfriend. She also claimed that Lama had seized documents related to court proceedings from Sobhraj and said she had lodged a complaint with the jail administration regarding this but they did not listen to her. Dr Khan's counsel Iqbal Jaffery pleaded the court to book President Musharraf, information minister Sherry Rahman, interior secretary Kamal Shah and Attorney General (AG) Malik Qayyum among others for contempt of court. The petitioner said that despite the court's verdict, Dr Khan's detention had not ended and he was not being allowed to meet his friends and relatives. Jaffery also filed a review petition in the same court against the earlier judgement, but the court returned it with objections. Chief Justice Sardar Muhammad Aslam said, “I cannot hear the review petition or the writ petition on a verdict given by me. As it is a criminal case under Article 369, a review petition cannot be filed against it." He asked the petitioner to move to the Supreme Court if unsatisfied by the decision. In response, Jaffery argued that Dr Khan was not a criminal and therefore, the case could not fall into the category of criminal cases. In the review petition, the counsel had requested the court to declare Dr Khan a free man, adding that it was the government's duty to provide him security. In its judgment, the IHC had barred Dr Khan from speaking on the nuclear proliferation issue, but had allowed him to meet relatives and travel inside the country after security clearance. “From our experience, it is very difficult to travel through space, and I personally think aliens have not visited our planet.” The Discovery delivered Japan’s Kibo orbital laboratory to the International Space Station in June. Kelly described the $ 1 billion, 32-tonne module as a “Lexus of a space station” where everything worked perfectly. “Certainly like a Japanese car, Kibo was very well-made,” he said. “It is going to be the premier laboratory of the space station for many years to come.” Japan, the last of the 16-nation partnership to get its hardware in space, is expected to complete the three-part lab next year. Japanese astronaut Akihiko Hoshide -- whose name means “Go to the stars” -- was part of the eight-member team. “Fourteen days was a short time,” Hoshide told the same news conference. “I wish I could have stayed longer.” During their mission, the crew successfully conducted three spacewalks to hook up the new lab, work on the station’s cooling system and fix a problem that was hampering a pair of solar wing panels from tracking the sun for power. A moderate earthquake struck east of Los Angeles on Tuesday, shaking tall buildings in the city but there were no immediate reports of injuries, major damage or power outages. The earthquake, which struck at 11:42 am local time (1842 GMT), was measured at magnitude 5.8. It was centred about 30 miles (48 km) east of Los Angeles near the community of Chino Hills, where it was felt strongly. But witnesses reported feeling the shaking strongly in neighbouring Orange County, as far south as San Diego and as far east as Las Vegas. There were no reports of power outages. Several small aftershocks were reported in the minutes after the quake. The Los Angeles Fire Department said there were no injuries reported in the city. Operations were not interrupted at the Ontario International Airport, the closest major airport to the epicentre of the quake. A spokesman for the Los Angeles International Airport said there were no flight delays at one of the world’s busiest airports as a result of the quake. Los Angeles city officials evacuated City Hall and some 40 miles (64 km) away in Anaheim, workers at Disneyland inspected rides for damage. The last big quake in the Los Angeles area was the 1994,Northridge earthquake, which registered a magnitude 6.7, killed 57 persons caused considerable damage. Magnitude 5 quakes are considered moderate but are still capable of causing damage. The USGS said Tuesday’s quake was shallow, only 8.5 miles (13.6 km) deep.